Once again we’re handing the podcast over to you, the listeners, to tell your stories and tips of starting and growing your blogs. Since episode 221 we’ve been hearing from our listeners about their blogs as a lead up to our new (and completely free) ‘Start a Blog course’, which goes live on 10 January 2018. You can sign up to reserve your spot in the course at problogger.com/startablog. Today we’re we’re featuring another two bloggers from the same niche. In this case, they’re both finance bloggers. I met both these guys for the first time at our SuccessIncubator event in 2017. In fact, they both spoke and did great sessions. Darren: Hey there and welcome to episode 229 of the ProBlogger podcast. My name is Darren Rowse and I’m the blogger behind ProBlogger. A blog, podcast, event, job board, series of ebooks, courses all designed to help you to start an amazing blog, and to build profit around that blog. You can learn more about ProBlogger over at problogger.com. In today’s episode, we’re continuing this series of blogger stories where we’re hearing from readers of ProBlogger and listeners of this podcast telling their stories of starting a blog and some of the opportunities that that blog has opened up for them. They’re also sharing some of their mistakes and tips for those of you who are starting out. But also you’ll hear today tips that I think are really relevant for those who are along the way with their blogging as well, particularly today, we’ve got a couple of tips that I think are particularly relevant for bloggers who’ve been around for a while, bloggers who maybe had been blogging maybe for a few years and things haven’t quite worked. Today is really relevant for both new bloggers and older bloggers as well. This series started back in episode 221. If you haven’t heard them, we’ve been pumping them out on a daily basis for the last week, there’s quite a few there now. We’re hearing from DIY bloggers, travel bloggers, recipe bloggers, nutritional bloggers, all kinds of bloggers. Today, we are hearing from two bloggers both from the same niche. They’re both finance bloggers and both of these guys who I met for the first time in 2017 in person, I met them at our Success Incubator event in Dallas. Both of these guys, a lot of fun, they both actually spoke at the event and did amazing sessions. There’s a lot of wisdom behind both the men. I do encourage you to check out their blogs. You can find today’s show notes with links to their blogs as well as a few things that they mention along the way over at problogger.com/podcast/229 and you can also leave a comment there. Remember, all of this is a part of our launch sequence for our new course for those of you who wanna start a blog. If you’re thinking about starting a blog, head over to problogger.com/startablog. I’m gonna come back between these stories to just make a few comments, throw out a few points, and then at the end I wanna tell you something new that I haven’t told you yet about the Start A Blog course, so stay tuned right to the end today. 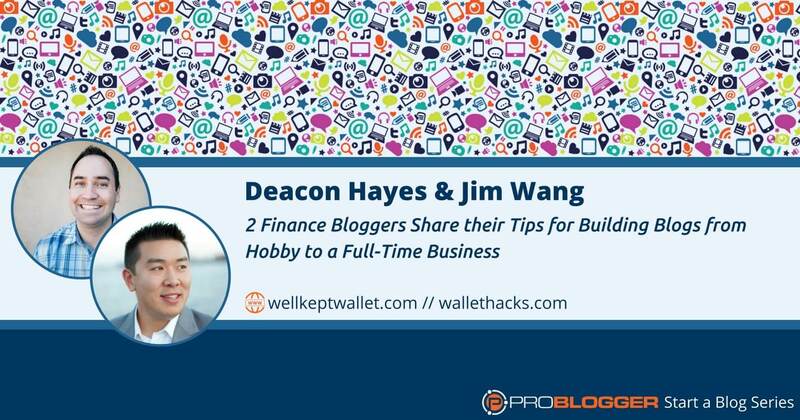 The first blogger I wanna introduce you to today is Deacon Hayes from wellkeptwallet.com. He’s got an inspirational story. He’s gone from being a wood flooring salesperson to full time blogger over the last few years and has some really useful tips. As I mentioned at the top of the show, some of these are quite relevant for those of you who’ve been blogging for a while now. I’m gonna hand it over to Deacon. Deacon: Hi, my name is Deacon Hayes from wellkeptwallet.com where we help people save money, make money, and pay off debt. Back in 2009, my wife and I got married and we decided we’re gonna combine our finances. We did that. We realized we had $52,000 in debt which, for us, in our 20s, was a lot. This was outside of mortgage debt and we’re severely in the negative. We knew we need to put together a plan to pay it off in a short period of time. Hence, created wellkeptwallet.com as kind of a way to track our journey, hold us accountable, but also to help other people that were trying to pay off debt by giving tips on how to save money, make money, strategies to pay off debt. Originally, that was the idea. But we were able to pay off all of our debt in 18 months which was amazing. We set this goal, we hit it, and now I was like, “Wow, this would be so much more fun than selling wood flooring,” which is what I was doing at the time. Then, it led me on a journey to kinda figure out, “How could I make money with the blog?” Turned that into a full time job and that’s what I’ve done today. When I first started out, one of the things I was most grateful for was learning SEO, search engine optimization. Because initially when I started the blog, no one was reading it. I would tell my friends about it and it was deaconhayes.wordpress.com. It wasn’t a legit site but then I learned SEO, I put it on wellkeptwallet.com, started ranking for some really competitive keywords, getting traffic, and then figuring out how to monetize it. Really encourage people that start out to kind of learn those different ways to drive traffic early on so you’re not just writing content that doesn’t get read. I did make some mistakes along the way. One of the things was I would just write just to write, not with any kind of intent. I had an audience of five people or whatever, and I’m like, “I have to publish content.” There were short articles, they weren’t thorough. It just really didn’t do the job. Now, we write articles with purpose and don’t write just to write. I really encourage people that are starting out to do that. Along the way, we had a lot of cool opportunities, been featured on US News World Report, Yahoo Finance, and even my wife and I were on the homepage of CNN Money one day for our worst money mistake as newly weds or something. It wasn’t the most glorious thing but the tips were very helpful, I think, for people. That was just a good way to get exposure. We used HARO for that which is Help A Reporter Out and reach out to these different publications, share our story and we found that to be super helpful. Now, we get over 700,000 page views a month which is crazy. Because last year, we’re getting a fraction of that. Now the blog is not a hobby anymore. It’s a full fledged business, makes six-figures a year. It’s an awesome opportunity, never would have thought I would be at this place with it. There’s all these things that I was doing to basically help kind of move the needle forward. Those were the categories that we stuck with. I really encourage you if you start now to look for those categories that you’re really good at, that really could add value to your readers. Think about less is more. Don’t write just to write. Write with purpose. Darren: That was Deacon Hayes from wellkeptwallet.com. Love that story and it’s one that I’ve heard echoed, I guess, in many stories over the years. I wanted to share it for a few reason today. Firstly, as we heard in yesterday’s episode from Joanna Penn, the power of search engine optimization. Deacon mentioned that he was grateful that he learned SEO. Actually, at our Success Incubator, he did a whole session on SEO. It was one of the main reasons that his blog went from a hobby, something that he did on the side, to becoming a full time thing. SEO really changed the trajectory of his business. Learning that is such a powerful thing. The mistakes that Deacon mentioned, he used to write just to write. He used to write short and non-thorough articles, and now, he writes with purpose. I really wanna hammer that home. Write with purpose, it’s such a powerful thing. Actually, every post you write has the potential to build your brand, to change the life of your reader, to make a connection with them. Every post you write has the potential to be shared by your readers as well and help you to grow your blog. None of those things is gonna happen if you just write just to write. If you’re just creating content because you wanna publish content, then it’s not actually gonna make any difference. In many ways, you’re wasting your time but if you’re writing with purpose, if you’re thinking about who is searching for the content that you’re writing, what questions they have, how you can change their life in some way, everytime you publish something, you’re going to publish something that can build your business and that is gonna make the world a better place in some way as well. That’s why Deacon’s blog is now 700,000 page views a month, that’s why he has a full time income, it’s because he writes with purpose. Deacon mentioned there HARO. I just wanna mention that again. I’ll link to it in the show notes today. Helpareporter.com, this is a service that will hook you up with reporters, with journalists who are looking for people to quote in their articles. This is what got Deacon on the television, this is what got him featured in a variety of websites. It’s a great service. If you are looking to build your audience through mainstream media, you might wanna check that one out. The last thing I’ll just emphasize there is something that we’ve heard numerous times over this series already. I didn’t really intend for us to go down this path. I didn’t realize how many people are gonna say the same thing but narrow down your focus, narrow down your niche. He said he went from 40 categories to 3. I think that is really well worth saying. I think that this is a really good tip not only for new bloggers but for established bloggers as well. This is an advice that we’ve heard from our tech bloggers in Episode 222, we saw it in the Orlando dating ideas blogger that we had in 226, episode 226, and even Kris in the travel episode as well who said, “Think about who you’re not going to serve and be really intentional about just serving a narrow niche of people.” This is great advice. Really, if you have had a blog for a while now, I wanna encourage you to think about what categories do you have. What are you writing about that’s not getting the traction? Deacon’s advice there was to really think back about what you’re good at. Identify what you’re good at writing about, identify where you are adding the most value to your readers, and focus upon those topics. I’m sure Deacon goes slightly off topic from time to time but going from 40 to 3 categories to me is a really smart move. If you are starting a blog, really think about narrowing that focus down, becoming the expert in a smaller topic. Unless you’ve got a lot of time and energy on your hands, you’re probably going to find a lot more traction doing it that way. If you’ve been blogging for a while, great advice as well. As we go into 2018, what did you write about last year that really didn’t get the traction and that really didn’t add much value? Maybe you strip out some of those categories for a while and just focus on the things that are really getting the traction. Thank you so much, Deacon, for your story. I wanna move now to Jim Wang from wallethacks.com. Jim is another person that I met this year in Dallas and we actually rode mechanical bulls together. But that’s a whole other story. I’ll leave you to go for a hunt for the video evidence of that. I think you’ll find it in my Instagram account if you really are desperate but we had a great time in Dallas. Jim has got a great story, well, some similarities with Deacon’s story as well. He’s obviously a finance blogger too but I’ll hand it over to Jim and then I’ll wrap things up towards the end. Jim: Hi, my name is Jim Wang, I write Wallet Hacks, wallethacks.com. It’s a personal finance blog that I started about two years ago and I share the strategies I use to get ahead financially and in life. It’s actually the second blog that I started. I started one in 2004 called Bargaineering, also about personal finance and it grew to a point where I was able to sell it a bunch of years later for a significant sum. I started blogging back then not because I wanted to start a business but because I just had no idea how to manage my money. I started my first day of work, they handed me this employee manual, I had to make all these decisions about… I have to start at $401k, what do you wanna invest in, here are the fees, it was just a big mess. I thought to myself if I’m having trouble at this, maybe other people are. I’ve always loved the internet. 2004, blogs weren’t really a huge thing. They had only just started becoming popular and I thought to myself, “I can start a blog. It’d be a fun little hobby.” If nothing else, I can connect with other people and we can learn from each other in a way that was better than me just trying to read a manual or read things online not really knowing whether or not I was right or wrong. My friends, they weren’t really that interested in talking about it. As often as the case, people don’t talk about money in person. But on the internet, you can talk about anything. I thought I’d start a blog, and over time, it sort of grew in popularity. I learned that I was the only one writing about money. I started networking, and emailing, and instant messaging other bloggers. There were maybe around a dozen of us back then. Nowadays, personal finance blogging is huge, there are thousands of blogs out there. Back then, it was a much, much smaller community. We all knew each other, we shared ideas, it was really great. If I were to look back and think of some mistakes, it was that I treated it like a hobby for far too long. Started a blog, people started showing up, didn’t really feel like a business so I treated it like a hobby. I didn’t invest in the things that I should have, like investing in technology, investing in people, investing in tools, and all the other things that a business does in order to grow it bigger than a one-man operation. It wasn’t until a couple years into it that I started doing that. It really paid off dividends down the road. If I were to think back to mistakes, it’s really the investment aspect of it. There are a lot of good things that have happened as a result of starting a blog. First off is that I learned a lot about managing money because I write about it all the time. Our finances are relatively strong as a result of just being responsible. A blog also keeps you accountable to your readers, some who you know and are friends with you in person, some who are complete strangers but it’s all the same. You’re sharing your story and people will call you out if you’re inconsistent or if you’re faking it. That accountability is very honest and very good. The other good thing is that when I started the blog, I was working a corporate job full time. Now, I work for myself running Wallet Hacks and that’s in part because I start a business and it gave us the financial freedom to build or pursue the things that we want. That’s always floating out there for folks that are wanting to start business. If you reach success, that’s a good thing because that means you can focus more of your time and energy on this. A lot of folks will say, “Well, I start a blog. I don’t wanna make money. I don’t want it to be about money.” I would say stop thinking about it in those terms. It’s not about making money is bad, making money is a noble good. Think about it like this, if you’re doing this on the side and you really love what you’re doing and your readers really love what you’re doing but you’re not getting paid, you still have to work a job to pay the bills. If this project can earn you a living, that means you can spend more of your time and energy pursuing the things that you enjoy and the things that your readership wants you to pursue. Think about it in those terms and you might not be so worried about making money from your project. If I were to come up with a tip for new bloggers, it will be just to start. Just get into it, reach out to as many people as you can. You wanna find folks that are roughly at your level in terms of blog knowledge and maturity so that you guys can learn together and grow together, make some of the same mistakes. You wanna reach out to potential mentors that maybe, a year ahead of you, two years ahead of you, in terms of size and development. That way, they can point you in some of the good directions. I would avoid trying to reach out to superstars, in part because they may not remember what it’s like to grow a blog from 0 to 10 people a day to 100 people a day. They may not be current on what the trends are today to grow it to that size. You wanna kinda build a mastermind group or a little cohort of folks that you can just talk to who are just dealing with the same struggles that you are, that way, you can both commiserate, give each other confidence, and learn from the mistakes that each of you are making. Most importantly is don’t give up. I’ve seen so many blogs over the years, I’ve been doing this since 2004. I’ve seen hundreds of blogs that have started that I thought were really good but for whatever reason, they failed, they stopped. Life got in the way sometimes. They start a family, the hobby time that they had after work or before work that was once there is no longer there. Try to persevere, and if you do, you’ll look back and you’ll be amazed at what you’ve been able to accomplish. Thanks for letting me share my story with you and I hope you learned something from it. Bye. Darren: That was Jim Wang from wallethacks.com. Great voice for radio or for podcasting, Jim. Thanks for sharing your story. A few things there in Jim’s story. Again, some similarities, I guess, in terms of why he started blogging to Deacon. But I really wanna draw out what he was talking about with the mistakes that he made of treating it as a hobby for too long and not investing into the business as if it was a business. This really echoes from my story as well. For me, first couple of years of my blogging, it was a hobby, and I treated it maybe as a business one day but I didn’t actually treat it as a business today. Really for me I saw exactly the same thing when I started to treat my blog as a business and invested more time and started to invest a little bit of money into the business, it really did pay off for me. I wouldn’t suggest you invest tens of thousands of dollars from day one but begin to think about investing and getting serious about your business. It’s more of the intent and the amount of time, and the intentionality. Writing with purpose as we heard in Deacon’s story. That is part of the investment that you bring, but gradually over time being able to invest in the technology, getting some better tools, and people as well. This, again, is a great tip for those of you maybe who’ve been blogging for a couple of years now. Maybe not quite getting that traction. Maybe it’s time to begin to ramp things up in terms of some of the investment that you can do because, really for me, for Jim, and for many other bloggers, this is something that we’d look back on with, I guess, gratitude, that we did take those steps, that we pushed rather than just coasted. Also, just the advice of starting. It sounds like the most simple advice that you can give someone. But so many people need to hear that advice. Maybe you’ve been thinking about having that blog for a long time. This is the moment to really do that, to get started, make a commitment to do that. This is a great time to do it because we’ve got this opportunity of the course that’s gonna walk you through it. I do wanna, I guess, offer you an extra little opportunity for those of you who are thinking about starting a blog. Jim’s advice there is to get a cohort, to get a group of people around you, and to work with people at your own level. That’s a very powerful tip and many people try and reach out to the superstar blogger in their niche. That’s not always the best person to help you. Because, as Jim says, they are on a different level. But they are also getting pitched a lot of times everyday. They’re hearing from a lot of people who want their help. You’re much more likely to get help from people at your own level or people just ahead of you. As part of our Start A Blog course, we wanna give you an opportunity to get together with a cohort of people at the same level as you. We’re actually starting a Facebook group purely for people who are starting a blog. We’ve got a Facebook group for those of you who are already going. If you haven’t joined that already, just do a search on Facebook for ProBlogger Community. You’d find a cohort of, I think, we’re up over 10,000 bloggers now who are blogging already but we wanna start a smaller group just for people working through the Start A Blog course. If you sign up for the Start A Blog course which is completely free, just go to problogger.com/startablog, we will send you some details. And as part of that, you’ll also get an invitation to the Start A Blog Facebook group as well. That will be a place where we can work through the course together, where you can ask questions, where you can interact with other bloggers at a similar level to you, and also you can make suggestions on how we can improve that course along the way as well. Because this is the first version of it, and we do want to continue to improve it and make it better, and better, and better. We already had, as I’m recording this in December, this is going live on the 4th or 5th I think of January. This is going on the 4th.. Even at two weeks before this episode goes live, we’ve already have almost 500 people sign up for the course. There’s gonna be a lot of people going through it together. The advantage of that is that we’re gonna be able to promote each other’s blogs. That’s what we want this group to be about as well. It’s not just about the learning together but we’re also gonna try and find some creative ways of promoting each other’s brand new blogs. We wanna help you not only to set up your blog, but we wanna help you to find some readers for that blog through this process. One of the ways that we’re gonna do that is through the Facebook group where you have opportunity to share your blog with the rest of the community and perhaps even begin to link to one another. Thanks for listening today. Thanks so much to Deacon, to Jim, for sharing your stories, very inspirational there. I hope those of you who are wanting to start a finance blog have appreciated that but also others of you as well. We’ve got three more stories coming up, one tomorrow, one on the 5th of January, we’re gonna hear from someone who’s got a completely different niche. I’ve never even knew that there was a blog on this particular topic, voice coaching. That blogger has an interesting story to tell, you’re actually gonna hear a little bit of singing in that episode as well. Next week, we’ve got two more bloggers as well. We’ve got another tech blogger story. Then we’re gonna hear from a blogger who is writing another slightly unusual topic. I didn’t know there were blogs about it but it’s a blog for women who live on islands. They’re the three upcoming episodes before we get this course launched. Again, if you wanna start back at the start of the series of bloggers stories, go back to problogger.com/podcast/221 to hear the first in the series and there’s been quite a few since. Thanks for listening today. Today’s show notes are at problogger.com/podcast/229. Thanks for listening, chat tomorrow. The post 229: 2 Finance Bloggers Share their Tips for Building Blogs from Hobby to a Full Time Business appeared first on ProBlogger.